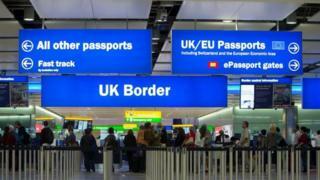 The Office for National Statistics said it was the first time in two years the balance of people arriving and leaving the UK had dipped below 300,000. But it is short of the government's aim of an annual figure below 100,000. Immigration was estimated to be 596,000 - comprising 268,000 EU citizens, 257,000 non-EU citizens and 71,000 British citizens. This included the highest level ever recorded of Romanians and Bulgarians - 74,000. Some 323,000 people are thought to have left the UK in the year to September, up by 26,000 on the 12 months to September 2015. Of these, 128,000 were British citizens, along with 103,000 EU citizens and 93,000 non-EU citizens. Net migration is down. But while the net decrease looks substantial, nobody can say for sure what's triggered the change because these quarterly figures could have been influenced by a string of short-term factors. For a start, there appears to have been a rise in emigration - and when that goes up, net migration can come down. Secondly, some of the change could be down to seasonal fluctuations in student numbers. Thirdly, although there were significant departures by people from some parts of Eastern Europe, the number coming from poorer Romania and Bulgaria went up. The upshot is the overall number of people arriving for a job is broadly the same. What does it all amount to? Immigration statistics are an inexact science - and at the moment it's very difficult to know for sure what's going on. The figures are the first to include migration estimates following the EU referendum in June. Nicola White, head of international migration statistics at the ONS, said it was "too early" to say what effect the referendum has had on long-term migration. Home Secretary Amber Rudd accepted the government was still far from reaching its net migration target, but said the figures demonstrated "we can reduce immigration where we can control it". She denied a rise in people going back to countries such as Poland reflected an uncertainty among EU citizens living in the UK over their futures. Ms Rudd said: "At the moment we have open immigration with the EU members, freedom of movement, so they can come and go as they want. "I don't see any particularly significant change within EU migration. The real change will be when we leave the EU, and then we will be able to make the choices ourselves what level of immigration we want to have." And she said that Britain remained open to EU citizens already living here and contributing to the economy, saying: "Let's not be in any doubt that the UK will always be a welcoming place for people who want to come here, work here and contribute to our economy." Sunder Katwala, director of the think-tank British Future, said the figures showed the immigration debate will "have to move on" in the light of Brexit. He said: "A one-size-fits-all approach to immigration can't help us make the post-Brexit choices that the government and the public now face." Meanwhile, separate figures from the Home Office show that a near-record number of EU nationals were granted British citizenship last year. Citizenship was given to 16,754 people from EU countries, the second highest since records were first compiled, behind the 17,645 in 2013. Some 6,498 members of the EU 14 countries - older member states such as France, Spain and Germany - were granted UK citizenship in 2016, up 50% on the previous 12 months and the highest ever for a single year. A further 6,813 people from the EU 8 countries, which include Poland, gained British citizenship, a rise of 18%, surpassed only by figures for 2013. Citizenship was given to 3,215 Romanians and Bulgarians, up 20% on 2015 and again only topped by 2013 figures.